Apple’s digital assistant is one of the company’s more limited offerings. While she’s not as powerful as competitors like Google Assistant, Siri’s abilities have improved over time. There are some tasks that are actually easier with Siri than without. 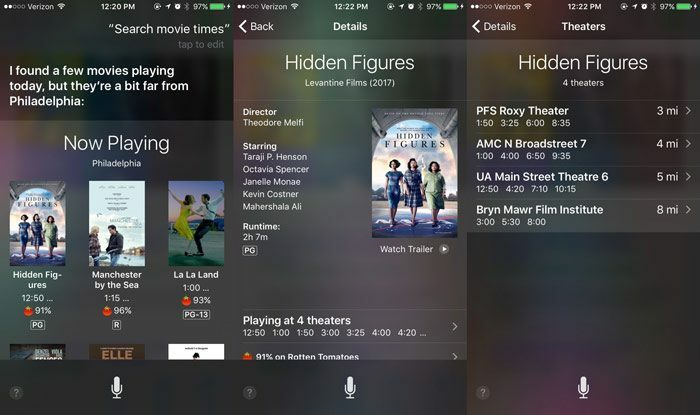 Here are a few Siri commands that are actually useful. Siri is pretty good at placing phone calls too. 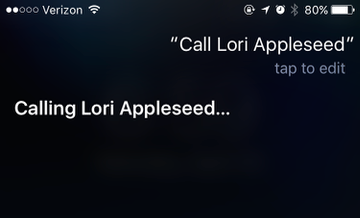 Say “Call Lori Appleseed” and Siri will immediately place the call. You can also say “FaceTime Lori Appleseed” to initiate a FaceTime call. 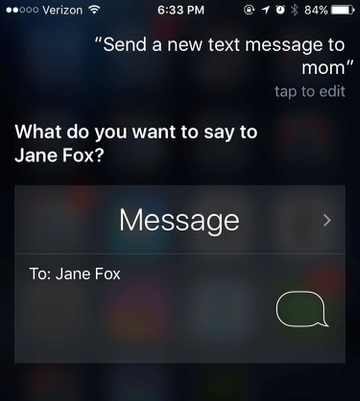 You can both send and receive text messages through Siri. Say “Send a new text message to Mom” to start composing a text message to your favorite woman. You can also say “Read the last text message from Mom” to hear the last message received. Unfortunately, this only works for one message at a time: if you’ve just received a flurry of messages, you’ll only be able to hear the most recent addition. Also note that this works with Siri’s relationship awareness. 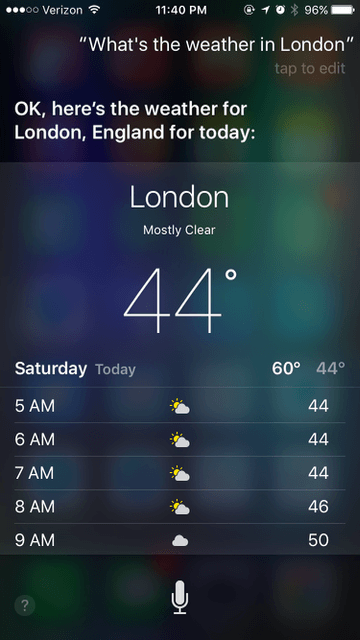 Siri can quickly toggle some basic settings. 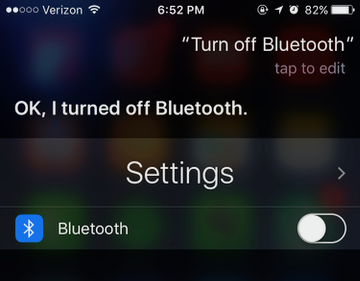 Say “Turn of Bluetooth” and Siri will quickly disable the interface. You can also ask Siri to toggle services like Do Not Disturb, airplane mode, cellular data, Wi-Fi. 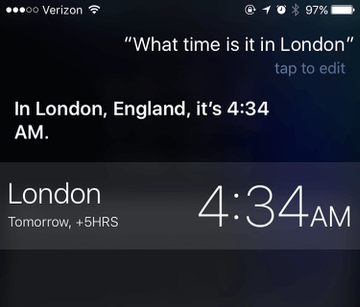 I would venture to guess that most folks know Siri can set timers, but if you don’t, get on it! 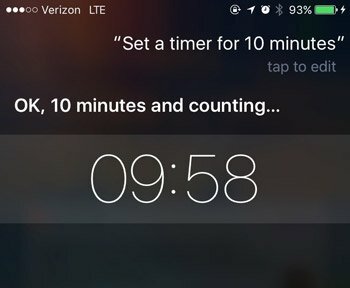 Activate Siri and say “Set a timer for 10 minutes,” and Siri will automatically start the countdown. Excellent for when you’ve got messy cooking hands. 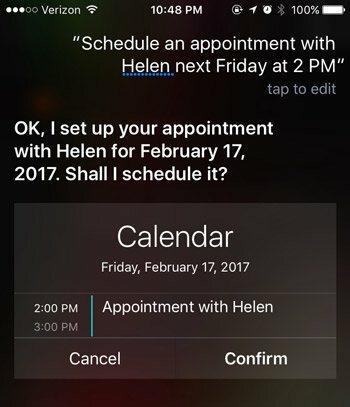 You can take advantage of Siri’s natural language processing to quickly add events to your calendar.“Schedule an appointment with Helen next Friday at 2 PM” will create that calendar event. It will also scan your contacts for anyone named Helen and link them to the event, if found. This is more elegant than using the built-in calendar app and faster to boot. I tend to get a lot of ideas while I’m driving, but that’s not really a situation where pen and paper is easily accessible. 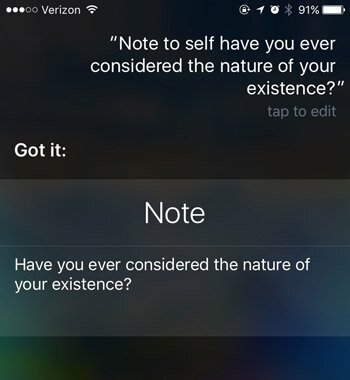 I use Siri to take notes instead. The voice trigger for this command is fairly flexible. Start with something like “Note to self…” or “Make a note…” and Siri will create a new item in Notes containing whatever you say afterwards. Setting a reminder is really some Siri 101 stuff, but it’s still outrageously useful. 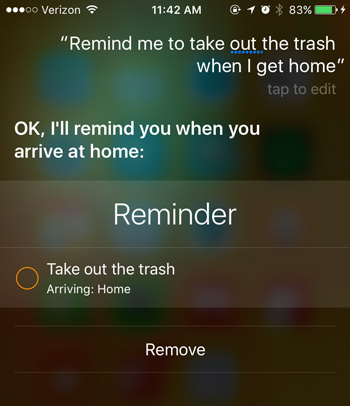 Contextual, geofenced reminders like, “Remind me to take out the trash when I get home” work nicely, and Siri is flexible with the commands she accepts for this prompt. 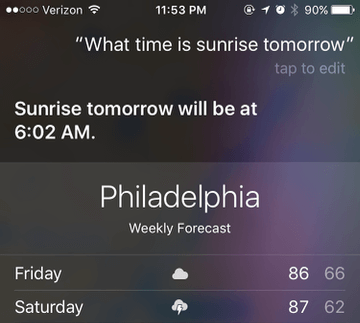 Siri commands like “Set a reminder for…” or “Don’t let me forget to…” work equally well. Even if you don’t love Apple’s Reminders app, it’s still useful for once-in-a-while commands. I’m not a huge fan of the default Apple Clock app, but a lot of folks use it daily. 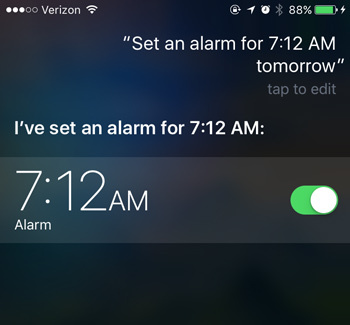 Set one-off alarms with the Siri command, “Set an alarm for 7:12 A.M. tomorrow.” Way better than using the system time picker. 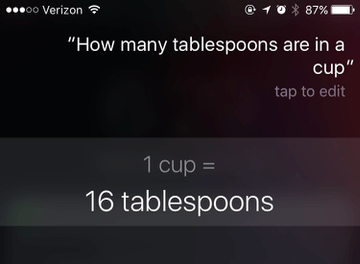 You can harness Siri’s unit conversion power by asking something like “How many tablespoons are in a cup?” You can also break Siri pretty fantastically if you mix and match units randomly, which can be fun in its own right. Pronouncing a word and spelling a word are two bits of knowledge that are only loosely related. Rather than typing incorrect permutations and hoping AutoCorrect catches your meaning, check the spelling through Siri commands. 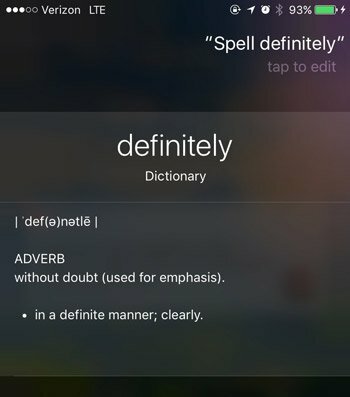 Just say “Spell definitely,” for example, and Siri will reply with a text box showing the word. She’ll also spell it out loud, so maybe don’t do this around people that you want to impress. 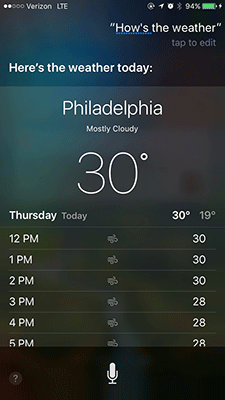 Get quick weather updates through Siri commands. You can trigger this one with a wide variety of Siri commands, from a conversational “How’s the weather?” to a more direct “What’s the temperature?”Either way, you’ll get a quick summary of current conditions by voice. You can also check the screen for the day’s hourly forecast. Siri can also be more specific. Ask “What time is the sunrise tomorrow?” or “What’s the relative humidity today?” to get more detailed weather information. You can find out the weather anywhere in the world to: try “What’s the weather in London?” to see how your favorite cloudy city is doing. 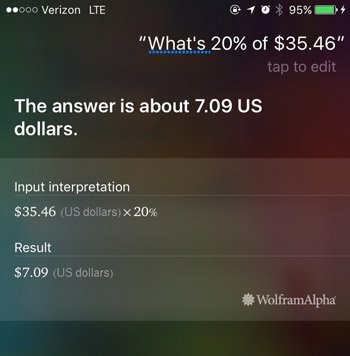 Ask Siri “What’s 20% of thirty-five dollars and forty-six cents?” and she’ll reply with the correct answer, $7.09. This is especially useful if you forget how to calculate percentages after you’ve had a few drinks. 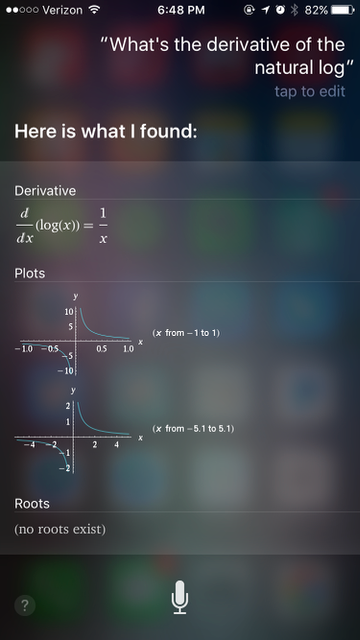 Get some help on your calculus homework with Siri’s Wolfram Alpha integration. 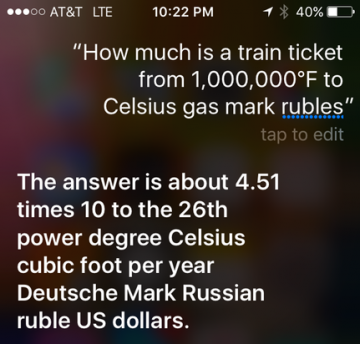 Ask “What’s the derivative of the natural log?” or a similar question and Siri will give you some graphs and trivia about the answer. You can also leverage Wolfram Alpha’s database of scientific knowledge. 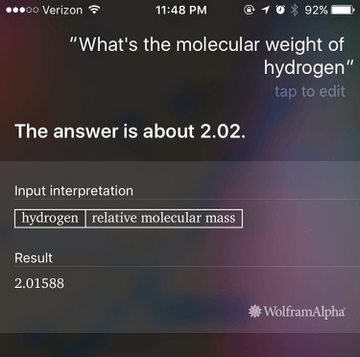 Try “What’s the molecular weight of hydrogen?” to get the correct response. 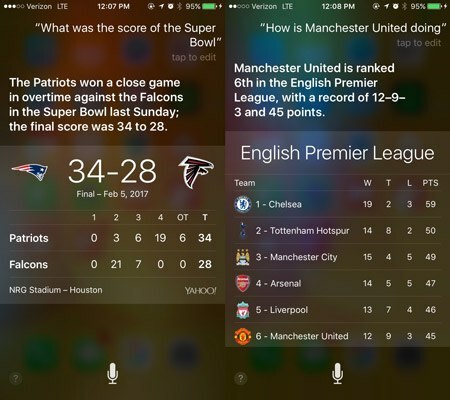 As with sports scores, Siri can fetch very specific kinds of structured information. 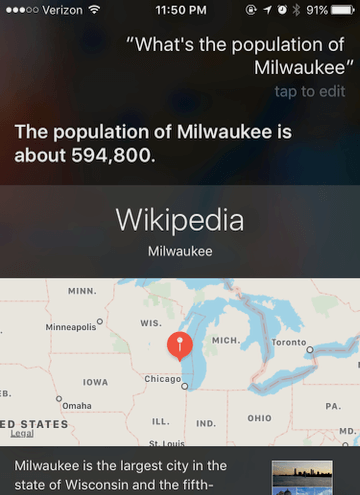 The population of a specific city is one of those: ask her “What’s the population of Milwaukee?” to discover it’s more larger than you thought. 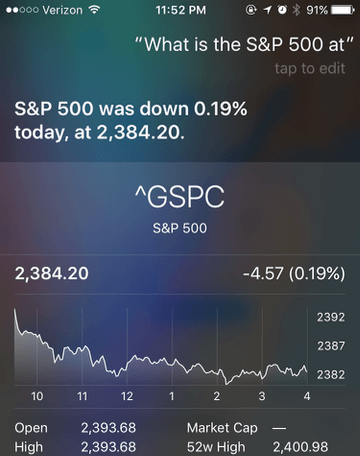 If you want to stay casually up to date with market conditions, you can check individual stocks or popular indexes through Siri. Ask “What’s the S&P 500 at?” to find out today’s moves. You can also use Siri to find the definition of words. 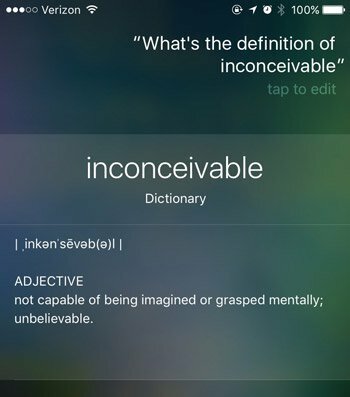 Say “What’s the definition of inconceivable?” and Siri will reply verbally. This might be another context-dependent usage, but it’s great for words you’ve heard spoken but don’t know how to spell. 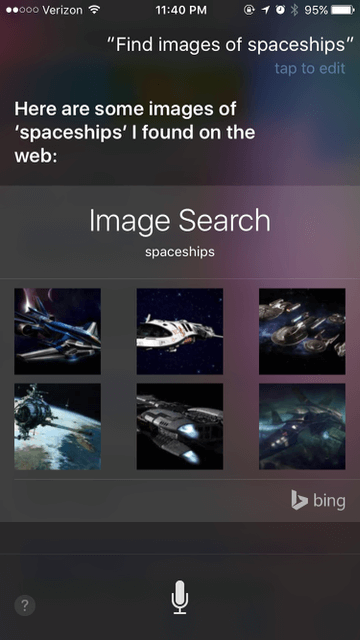 Siri can contextually display images that match a specific search terms using Bing. Say “Find images to spaceships” to get a glitzy display of space-faring crafts. Just like images, Siri can display Wikipedia articles contextually. 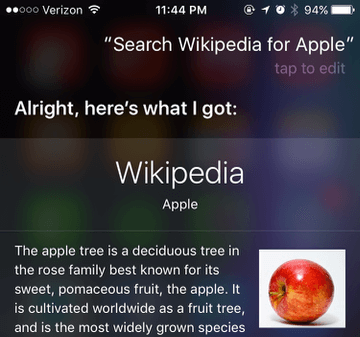 Say “Search Wikipedia for Apple” to get the Wikipedia page for the wrong kind of apple. You can figure out the distance between two cities. 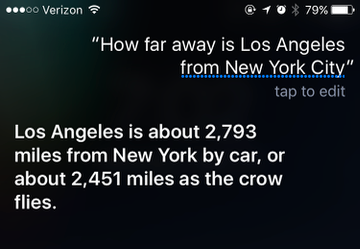 Ask “How far away is Los Angeles from New York City?” for example, to get the distance both by road and by crow. 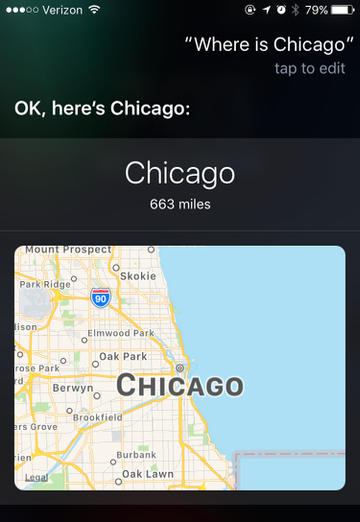 Siri can access Apple Maps to find various locations. Ask “Where is Chicago?” to see the Windy City on a map. You can harness Siri’s mapping power to found your way to landmarks, businesses, and specific addresses. 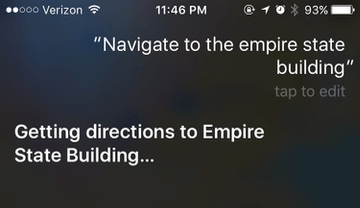 Say “Navigate to the Empire State Building” to pop open Apple Maps and find the quickest route. 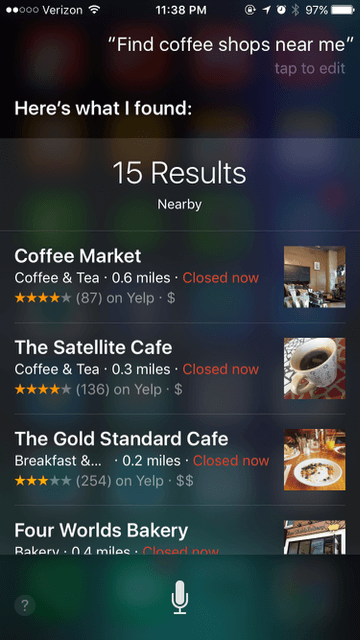 Siri can search for nearby business in specific categories, like fast food, pizza, Chinese restaurants and more. Try “Find coffee shops near me” to get some localized recommendations. Say “Search movie times” to see a list of the movies that are currently playing nearby. While a lot of apps can pull this off (Google included), Siri’s UI for this feature is appealing and easy to navigate. I especially appreciate the built-in Rotten Tomatoes scores. Tap on a movie’s poster image to see a description, and then tap “Playing at…” to see the list of theaters current showing the film. Thanks to the third-party app integrations added to iOS 10, Siri can now trigger events in non-Apple apps. One of the most useful integrations is starting a workout. 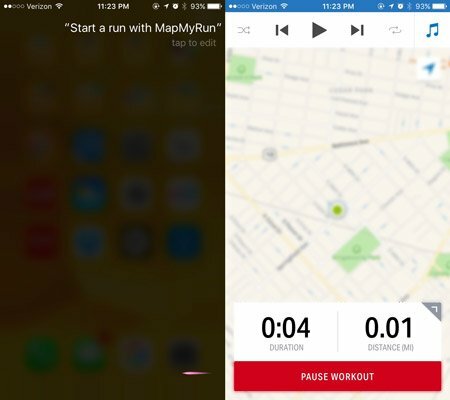 Just say “Start a run with MapMyRun” to begin tracking your workout. This will also work with Runtastic, Zova, and Nike+. 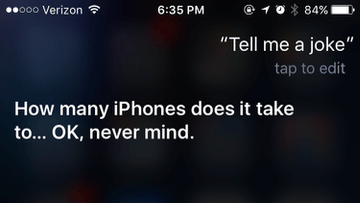 Siri has a surprising number of incomplete iPhone jokes on tap. Say “Tell me a joke” to hear something of dubious funniness. Great way to occupy a kid for a few minutes, though. You can ask Siri to call you by your referred moniker. 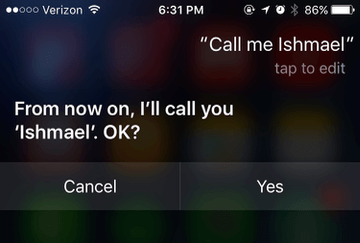 Say “Call me Ishmael” and Siri will be happy to comply. This trick really only works if you have a huge iTunes library or an Apple Music subscription. Say something like “Play Kanye West” to get started. 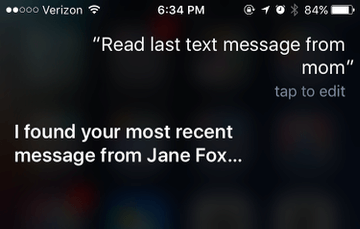 This isn’t really a Siri tip as much as it is a fun Easter egg. 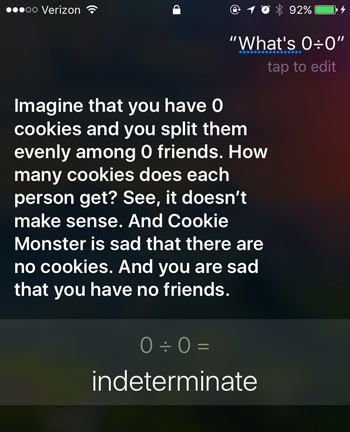 Ask Siri “What’s zero divided by zero?” and you’ll get a fun explanation involving a friendless cookie addict. Siri has not yet reached the level of an all-purpose digital assistant, but she’s getting there. If you take the time to experiment with what she can do, you might be surprised at how helpful she can be.